Green Ox® Pallet Technology provides confidence in performance. Green Ox Pallet Technology’s patented designs are rigorously tested by an independent ISTA (International Safe Transit Association) certified laboratory, internally using ISTA guidelines, and/or by individual clients to assure performance, product safety, and supply chain continuity. Test details: During this test, a plate of the dimensions of the pallet is placed on the pallet with a test load on top of the plate. The loaded pallet has a minimum of 1.5 times to a maximum of three times the weight (calculated by an ISTA formula). The weight is applied for one hour. Test details: During this test, a fully loaded pallet undergoes random vibrations (Grms Level of 0.54, with a stroke of 1.777” peak to peak for 240 minutes). This simulates a loaded pallet riding in a truck trailer on the road for 1,200 miles. As a result of this test, it was determined that Green Ox pallets absorb shock (wood pallets do not demonstrate this attribute). Test details: During this test, a pallet is tested at a velocity of 42” per second (18g’s). This simulates a load hitting a wall very hard, and to pass the test, the pallet must absorb the impact with a full load. Test details: This test has the same parameters as the Shock incline impact test, but is performed on a horizontal plane. Test details: During this test, a fully loaded pallet is supported 3.5” off the ground on one side and 7” on other side on a concrete or steel surface. The 7” support is yanked away from the pallet allowing it to fall freely onto a flat rigid surface and this procedure is repeated for all 4 sides of the pallet. 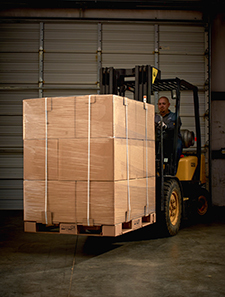 This test simulates rough handling of a loaded pallet by a forklift operator. In addition to following ISTA testing protocols when testing through an ISTA approved vendor, we also place great emphasis on our own internal testing plus having clients perform their own internal tests specific to their product, load weight / distribution, load configuration, shipment type, unification, and pallet use. Through a formal pilot testing process, we work closely with clients to test our pallet in real-world applications across their supply chain.